Extreme Flex without the extreme price! Rear: Lower high clearance arms with X-Flex joints, upper control arms with X-flex joints, track bar bracket, and hardware. 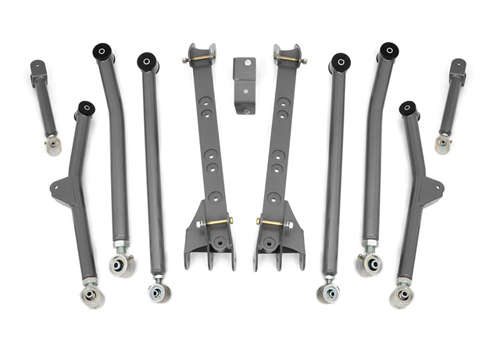 Upgrade your existing 4"-6" Jeep TJ suspension kit to a long arm kit! Upgrade for 4"-6" kits ONLY. Slip Yoke Elkiminator with CV Driveshaft is recommended to avoid driveline vibration. Rubicon models do not need SYE kit. CV Driveshaft is still recommended. Extreme travel long arms keep optimum alighment and give optimum articulation.